So, to a certain extent, she (Josephine) reminds me of the poet Michael Dransfield in my own younger days. Michael had a lyrical gift and became a cult figure in Australia when he died, but that left him at the mercy of more boring lives who lived longer to write more and they punished him and his writing for the hype being larger than the eventual worth of the writing. So let me go out on a limb and say that in many ways this offering from Josephine is a slight book. It reminds me of practice paragraphs at the writing workshop. They’re good for refining craft but I would not be rushing them into publication. If you go to a writing workshop in the US and make some connections then you are bound to get published in some local mags in the US. This causes reverence in cringy little Australia sometime. However…in my opinion, if her editors really loved her they would have waited for more substantial or coherent material. For me this looks like “practicing for the novel” – but that does mean that I and many other of the 5,000 literature reading Australians are waiting for the novel. And the much praise coming to this little book will prepare the way for a good acceptance of the novel. The risk of course – it better be good – or that loving adulation could turn as sour as all get out as rapidly as milk in the sun. In the end it is like swept up notes from the floor of a writer. They are better than the average scribble but they are certainly not substantial. Keep in mind, this is only one opinion in the face of many at the moment. Lyndon Walker Is a Psychologist, Psychotherapist, Educator, Writer and Poet living in Melbourne. He has five published books of poetry and was awarded the Pablo Neruda Prize for poetry in 1996. He is currently working on two novels. 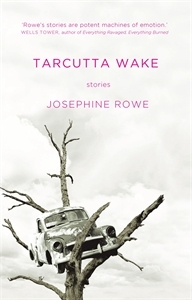 This entry was posted in Issue 5, Josephine Rowe, Lyndon Walker, Tarcutta Wake, UQP and tagged Australian Literary scene, literature, Michael Dransfield, writing by Mark Roberts. Bookmark the permalink. Thank you for the review. Now I really am intrigued. I might read it to help me define slight. Whilst I appreciate your opinion, I think that you are, perhaps, disregarding the validity and power of micro fiction: a genre that allows readers to swan in and out of a feeling or situation, without pre- and post-amble. Effective micro fiction requires a degree of craft unfathomable to most writers. If one is able to truly capture the feeling of love, loss, or yearning in less than two hundred words, they have, in my humble opinion, reached literary greatness. Short stories need not lead to novels, just as short films need not lead to features. There is a place for micro fiction in literature, and the irrepressible hunger for Josephine’s work – both nationally and internationally – proves that. We must encourage such innovative forms of literature, rather than discard them as practice runs for future work. If we are unwilling to do so, the literary pool will stagnate, and we don’t want that, do we? Our differing opinions on this topic, however, highlight the magic of literature (and art in general) – what deeply moves one person, can deeply bore another. I, personally, wouldn’t want it any other way. I do appreciate Josephine’s work, I think she is a fine writer I just do not happen to agree that all of this publication is fine writing. I also think you have provided an overwrought, overthought and somewhat defensive rationalisation which the writing itself does not need. I actually think her writing is better than that. As I said I thought my little reflection on this work will not be the majority view and I also think that Josephine and her writing are far above all this. May I go out on a limb and suggest I thought this website published reviews. Whatever else one may wish to call this piece of commentary, and regardless of the quality of Rowe’s book – good, bad, or otherwise – ‘review’ is not the word that immediately springs to mind. Hi Cam – Yes Rochford Street Review is primarily a review site. I do attempt, however, to expand the scope a little from time to time – for example I have run launch speeches for books. A launch speech is very different from a critical review – the speaker is much closer to the author and there is no pretence of objectivity. There have also been a number of much shorter pieces – some on actual books, others commenting another review in a different journal. This piece on Tarcutta Wake falls into this category. You will not that it has been labeled a ‘reflection’ rather than a review – probably not the perfect description but the intent was to highlight that it was not a full blown review. The intention of such pieces is to stimulate a debate – start a discussion. There are probably a number of directions a discussion based on this ‘reflection’ could go. For example it raised in mind questions about whether Lyndon Walker would have reacted to the book in the same was if it was published by a smaller literary publisher (UQP is one of the larger literary publishers around). I haven’t actually read the book yet but Lyndon’s piece, and the reaction it has achieved, has intrigued me and I will make an effort to read the book now and, quite possibly try and find someone to write a longer review on it. Thanks for the response. Yes, I’m aware you publish a range of things, and that they may vary in the approach taken to a particular text. I’d like to make the point though, that even a launch speech generally involves some form of engagement with the actual text. Lyndon is, of course, entitled to his opinion on this book – it would simply have been nice to see some attempt to substantiate his comments (beyond the opinion of the anonymous housemate). As to who the publisher might be, and without wanting to delve into notions of cultural capital, does it really matter? I feel bad to say it but I agree. Too first year UNI creative writing class, little substance. However, another ten years and I think she’ll be there.